Excitement levels are at an elevate high at the moment in the jailbreak community. The release of an untethered jailbreak solution for all devices compatible with iOS 9 by the Pangu Team managed to pretty much blindside everyone, but also once again bring jailbreaking to everyone’s attention. No matter what Apple do, those resourceful researchers and developers still manage to find a way around iOS’ security mechanisms. With iOS device owners from all over the world downloading and attempting to jailbreak iOS 9, we’re going to take a look at some of the common issues that could occur and how to rectify them. Here are some of the known issues as are being voiced by jailbreaking fans across the globe, coupled together with possible solutions. Turn off Find My iPhone on the device. Turn off Touch ID & Passcode. If you have tried all of the above and yet you get errors during or after jailbreak process, try the following fixes. If you’re getting stuck at 45% during the jailbreak process with Error 0A then you’re going to need to head into iTunes to resolve this one. With the iOS 9 device connected via USB, open iTunes and select the hardware from the bar at the top. Under the “Backups” header, make sure that Encrypt iPhone backup is not checked. Take an unencrypted backup of your device and try the jailbreak process again. Still getting the same error? Make sure you have enough storage space on your computer’s hard drive. Should be over 10GB. Update: If what is mentioned above doesn’t help fix error 0A for you, download Pangu 1.0.1 from here and then rejailbreak. Version 1.0.1 includes fix for this problem. This type of error is enough to terrify the average person attempting to jailbreak their device. The nature of the error makes it look extremely technical and will undoubtedly induce panic. If this particularly error is received as part of your jailbreak journey then the only way to bypass it and resolve the problem is to entirely restore the connected device to iOS 9.0.2 using iTunes and attempt the jailbreak process again. You can get iOS 9.0.2 from here: Download iOS 9.0.2 Links For iPhone, iPad, iPod touch [IPSW]. During the jailbreak process, when the jailbreak tool asks you to run Pangu app followed by prompting you to give access to Photos app, if at this stage your screen flashes blue and jailbreak fails at 90%, try the jailbreak process again only this time launch Photos app first before opening Pangu app when the tool asks you to. This one isn’t exactly an error, but it’s enough to mean that you can’t even attempt to jailbreak the device. If this is a problem that’s affecting you, then it is advised to (re)install the latest version of iTunes on your Windows machine and then try to connect your device by USB at least once. You can grab the latest iTunes from here. If you get “Runtime Error! … This application has requested the Runtime to terminate it in an unusual way …” when running Pangu on Windows, here’s what you need to do: Fix Pangu iOS 9 Jailbreak Runtime Error On Windows, Here’s How. If the “installed iOS Public Beta Profile” message is being presented as part of the process then you’re going to have to start deleting profiles from the connected device. Open the native Settings app and navigate to General. Select the Profile entry and delete the public beta profile before reattempting the jailbreak process. If you get “Error occurred in preparing the environment, err code (51)”, follow the steps as outlined here to fix the problem: Fix Pangu “Error Occurred In Preparing The Environment, Err Code (51)” During iOS 9 Jailbreak. If you think everything has gone smoothly, but there’s no Cydia app present on the device then don’t panic. The advice here is to launch the native Photos app within iOS before running the newly installed Pangu application. Exit out of the Photos app, run the new Pangu app and grant access when prompted. Cydia should then show up. For a fix for this, follow the instructions here: Fix Apple Logo Boot Loop Of Death BLoD On iOS 9 Jailbreak, Here’s How. Everything seems to have gone smoothly, but then Cydia crashes every time you try to open it. If this is happening to you, follow the instructions here to fix the problem: Fix Cydia Not Opening / Crashing After Pangu 9 Jailbreak [Guide]. Update: PreferenceLoader update is now available which fixes this issue. Grab the update on Cydia. This one is currently a known issue. PreferenceLoader, which is a small jailbreak utility that allows developers to grant a configuration tab in the native Settings app, has yet to be updated with iOS 9 support. This means that settings and preferences will not show for many installed tweaks, and in some cases certain packages will simply cease to work on iOS 9. This can’t be resolved until PreferenceLoader is updated by the developer. The good news is that the developer is aware of the issue and is working on the update for iOS 9. WinterBoard is not ready for iOS 9 yet. But there’s way around it to force it to work on iOS 9. Follow the instructions for it here: Fix WinterBoard Not Working On iOS 9 iPhone And iPad, Here’s How. If you happen to be experiencing issues that aren’t listed here, and the interface doesn’t provide you with any additional information, then it’s likely that your device had the latest version of iOS installed via an over-the-air (OTA) update. OTA updates are known to cause issues with jailbreaks for one reason or another, so the solution here is to entirely restore the device clean to stock iOS 9.0.2 via iTunes. To do this, you can follow our guide here: Download iOS 9, 9.0.2 And Install On iPhone 6, 6 Plus, 5s, 5c, 5, 4S, iPad, iPod touch [Tutorial]. Did the above solutions help fix your problems with Pangu 9 jailbreak? Know a fix that we don’t know of? Share it with us in the comments section below. Preference loader has been fixed. I got the popup: side by side configuration failed cannot open application any fix? Once I have the .exe file downloaded I get an error “this app can’t run on your PC” I have Windows 10 computer is about 2 years old. Any suggestions??? Alright so I jailbroke my 6s plus earlier this morning and everything including Cydia has been working fine. Now out of no where Cydia nor Icleaner will open. Both just crash upon trying to open. Any suggestions? Have you tried running it as an administrator? Or maybe try running it in compatability mode for an older version of Windows. I had the ‘/usr/libexc/cydia/cydo error(2)’ error problem and tried the fix mentioned above twice but had no success. I almost gave up but then decided to get creative and deleted vshare and all apps installed with it since they kept getting restored with my backup and were signed with cracked itunes accounts. Then I deleted all non official sources in Cydia (i.e. hackmyiphone etc) and created a new backup. Lastly I did another restore and backup restore and voila! Everything is working great now! Maybe you should have downloaded or installed windows 10 x64. Not x32. Everything was okay until i shut down my 6s and start it up again, then its freez on Apple Logo anyone having the same problem? I don’t think iCleaner has been updated to work with iOS 9’s new ‘rootless’ filesystem. likely what has happened is iCleaner has removed dependencies necessary for Cydia. I imagine this is why when you open iCleaner it says iOS 9 is not supported yet and to use at your own risk. You will likely have to either jailbreak again if Pangu will allow it or you might just have to backup and restore and then rejailbreak. I figured it out. Something to do with anemone. I deleted anemone through idols and everything works again. Icleaner had nothing to do with it, it works perfectly fine. Thanks Mathew. Why is the old 8.4.1 JB showing up. New 6s ruo9.0.2? Can’t remove taig from cydia. Connect your iPhone to iTunes and hold both the power and home buttons until the Apple logo shows up. Then release your finger off the power button but keep holding on to the home button. Your computer will detect the phone and force you to update and/or restore. If you’re lucky, only an update will be required. hi i keep getting cannot connect to itunes stores after jailbrak any help plz? Still no fix for stuck at apple logo. 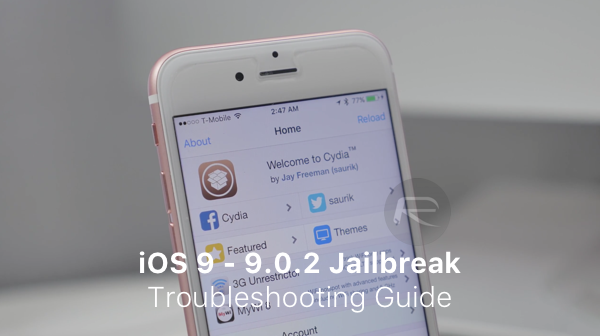 you need to perform the iOS9 jailbreak……….. on iOS9. which means you’ll have to restore and update……. to iOS9. if you were able to restore, you didn’t brick your phone. love the jailbreaks don’t get me wrong… But Why release the jailbreak before a major version. I have a conspiracy. Are they employed by Apple to find vulnerabilities in the software. Is this why they always release a jailbreak before the major version. Everyone’s always pissed off that they wasted an exploit. Same here. This seems to be an ongoing problem. They release the jailbreak and then complain that it has been patched by Apple. Hmmm. Want to know how you can change that? How about wait two weeks? That’s a brilliant idea! Thank you, that one is free. I got a blue screen boot loop on my 5s after jailbreaking 🙁 Nothing I can do to fix it. Be careful with this people.. I got a serious problem here… cant even get into it right now. keep restarting and blue screen.. i’ve tried few times with the emergency boot but still not working. iphone 6splus, everything installs fine, cydia works the first time around, as soon as something is installed from there, cydia stops opening. Tried the erase all content and settings and did a fresh install of ios 9.0.2 from itunes. same problem.. Get it together pangu. try to boot on no subtrate mode! then uninstall the recent app youve just intall on cydia then restart. Will do. Thank you for the reply! I’ll let you know if that works. Did you have a similar problem? I went to Ifile and navigated to /library/mobilesubstrate/dynamiclibraries and I deleted everything that had anything to do with anemone and then restarted my phone and it all worked again. 🙂 just make sure you go into Cydia afterwards and uninstall anemone through Cydia if it still shows up in there. Let me know if it works for you. Do you have zeppelin installed? I think that’s what’s causing the crash. btw install powerapp so its easier to boot on no substrate.